This was originally posted to CookSister! in November 2007, but seeing as I am away in Germany visiting my sister-from-another-mother Meeta this weekend and will not be online (much! ), I thought I woud repost it for this week’s Sundays in South African feature. Do you know the feeling when you know something is part of your heritage and you know you should like it… but you just don’t? Like my father growing up in the Afrikaner heartland of the Orange Free State province, but not liking braais. Or a Scotsman who can’t stand haggis. Or me, growing up in an Afrikaner household in South Africa and not really caring for melktert. And I have to say, I could have picked something easier to avoid. Melktert (literally “milk tart”) is one of those baked items (like koeksusters) that you really struggle to get away from in South Africa. Every school cake sale featured milk tarts, every home industry bakery is full of them, and everybody’s mom/sister/aunty/gran had their own secret recipe. But when a friend of my mom’s would come round for tea and say she had brough milk tart, my heart would sink. I wanted coconut tart, apple tart, fridge tart – just something with some taste! You see, milk tart is basically a baked custard tart and I’ve never been a fan of custard – just too bland for me. So my relationship with milk tart was kind of doomed from the start. 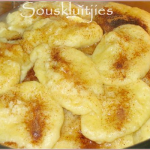 Melktert is one of the dishes that we inherited from the Dutch settlers who colonised the Cape in the 1600s. I had initially wondered whether melktert was not borrowed from the Portuguese who were the first Europeans to land at the Cape and continue to be a thriving community in South Africa, because the Portuguese pastel de nata is very similar to a mini melktert. But greater minds than mine seem to disagree and insist that the melktert we still eat today is inherited from the Mediaeval Dutch cuisine. The first mention of a similar dish in Dutch cuisine is in fact in the first cookbook published in Dutch by Thomas Van der Noot in 1510. Apparently, the Mediaeval diet in Europe was heavily influenced by religious restrictions. The church stipulated that feast days should alternate with fast days and so in most of Europe Wednesdays, Fridays and sometimes Saturdays (as well as days such as Lent and Advent) were fast days. On fast days, meat and animal products like milk, cheese and eggs were not allowed. To comply with these rules but still manage to have dessert, a porridge would be made on feast days consisting of almond milk, oil, cake flour, rice flour, ginger and cinnamon. Later, when the fast day rules were relaxed, milk and eggs were substituted for the almond milk (almond essence was added to compensate for the loss of flavour). Van der Noot apparently also included a “modern” recipe for melktert which included extra eggs and very little flour, bringing it almost entirely in line with the recipe we know today. The one I never liked. But then something happened. On my visit to Johannesburg a couple of years ago, I got together with friends for a braai and Bronwyn volunteered to bring a milk tart. She stressed that she would not be slaving over a hot stove making it, but did mention that she had found a shop that does excellent milk tarts. Hmmm. Unconvinced. So after dinner, the milk tart was brought out and I cut myself a small piece, not exactly filled with hope. But… what’s this? Firstly, the custard filling was actually wobbly, like a pannacotta, rather than like the foam mattress-texture that I recall from my youth. And the crust wasn’t the stodgy shortcrust I remembered, but puff pastry! 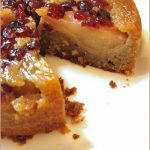 And far from being a disappointment, the taste merely confirmed what my eyes had already told me – a delicate wobbly custard filling in a featherlight crust with a generous dusting of cinnamon. Perfect! And so I began a thaw in my attitude towards milk tart and my quest to recreate this perfect tart. The traditional flavouring is cinnamon, but I figured if we were infusing the milk, we might as well make things a bit more interesting and add some cardamom. Pre-heat the oven to 200C. Line a 20cm diameter fluted pie dish with the puff pastry, leaving the edges raggedy and hanging over the edge of the dish. Bring the milk to a slow boil in a medium saucepan, then add the butter, salt, cinnamon stick and cardamom pod. Combine the custard powder, cornflour and cake flour. Add the cold milk and make a paste. Stir a little of the hot milk into the paste to thin it, then stir the custard paste into the hot milk in the saucepan. Make sure there are no lumps in the paste – and don’t panic too much if there are some lumps in the saucepan once you’ve added the custard – just make sure you stir vigorously and continuously to get them to dissolve. Add 2 Tbsp of the sugar and stir continuously. (I cheated a little and whisked the custard with a wire whisk to keep it smooth!) When the custard thickens, remove it from the heat and discard the cinnamon and cardamom. Beat the egg whites until stiff, then beat in the remaining sugar gradually and set aside. Beat the yolks slightly and then add about 2 Tbsp of the warm custard mix to the yolks and mix well. Stir the yolk mix into the custard saucepan and add the almond essence (if using). Gently fold in the egg whites. 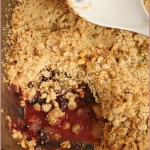 Pour into the prepared pie dish, sprinkle with cinnamon sugar and bake at 200C for 10 minutes. Then turn the heat down to 175C and bake for a further 10-15 mins, until puffed up and golden. Allow to cool on a wire rack and serve in slices with coffee. NOTES: This recipe was adapted from a couple I found on RecipZaar. I liked the idea of whipped egg whites as I figured there’s no way could it be stodgy with all that egg white in it – and I was right. It’s not a difficult recipe at all, but takes a bit of time as each constituent part needs to be worked on – and it does dirty a lot of bowls/pots! The addition of the cardamom was an inspiration, even if I say so myself, and I will definitely be repeating this as the taste is marvellous. I also loved the taste of the custard before I added the eggs. The flavour of the spices came through very strongly, and I would happily make flavoured custard like this to have with fruit desserts in future. The finished product not only looked lovely and puffed up in the oven like a soufflé but retained that lovely eggy wobbliness even after it had sunk down to normal proportions. It is light and very moreish and deliciously spiced. Definitely a keeper! If you liked this recipe you may also enjoy my coconut tart (klappertert) , mini pistachio tarts, or my Peppermint Crisp fridge tart. But I do love melktert. And am amused to realise, reading this, that my tastes are clearly highly irrational, because I don’t see the point of pannacotta. It does sound like a keeper Jeanne. Enjoy your time with your “sister” in Germany. Here is someone else who does notlike melktert! What I do to give it flavour is spread the pastry crust with lemon curd! I love melktert, but NOT with shortcrust pastry. The recipe I use comes from a book I’ve had for many years (and you should definately try to get a copy for yourself though I suspect it is out of print)it is ‘South African Culinary Tradition’ by Renate Coetzee. It is more of a history book than a straight forward recipe book. As for flavouring the melktert, infusing the milk with dried naartje peel gives it the most wonderful subtle flavour. Naartje peel is easy to dry in a cool oven and then stores in a sealed jar til needed. In my best Homer Simpson voice: Miiiiillllktaaaarrrrtttt. Suddenly I feel like having a nice big slice and a cup of real boere koffie. I’m a big fan of melktert (like the other 40 odd million South Africans I suppose), but I do think it’s nice to try and improve a classic. And it looks like you certainly did that! Love the added cardamom. I have never tasted a milk tart but I always thought it looked …well dare I say boring. You have now got my attention by adding cardamom. Not a good idea to look at this when I had no supper. Now I am so hungry! Caromom gives a nice twist! My friend is South African and always talks about this ‘milk tart’. I thought it was strange until I saw your photos, and read the recipe, and now I want to make one! hi it’s interesting and delicious foods. I am hungry. Lekke! 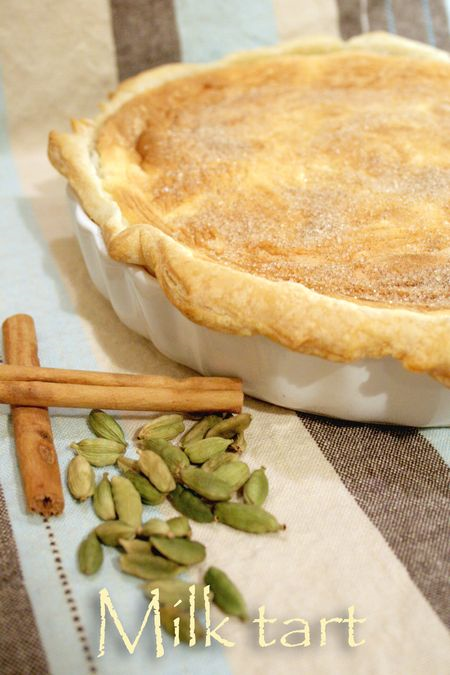 I’ve always like Melk Tert – the addition of cardamon is next level though! I will be trying it out soon. Sometimes I do wonder about our taste buds and how much it does change with time. I have never really read anything very scientific about it though. this thing about dishes which are a cultural signature is a funny one. when you seem not to join the crowd you can be seen as an extra terrestrial being. I love custard. cold or hot so the idea of this tart appealed to me straight aways. when you mentioned that you used cardamon..well, that was the nail on the coffin. Must try. @Val – it certainly is a keeper – comforting and spicy at the same time! @Herschellian – got renata’s book, both in English and Afrikaans 😉 it is a fab book though, packed with historical info. Love your naartjie peel idea and will definitley try it. @Hila – the wobblier the better 🙂 And I think it is supermarket milk tarts that give milk tarts generally a bad name! @Marisa – I love spicing up classics without altering the basic essence of the recipe – and in this case it worked realyl well. Give it a go! @Alex – had never hear of buttermilk pie – thanks for the link. love similar recipes from far-flung places! @fotographiefoodie – why not surprise your friend and make one! @Juliana – it’s the perfect balance between conforting and spicy. You’ll love it! @Valentina – if you like custard, this is the tart for you 🙂 The cardamom certainly takes it to another level! I’m with Valentina – have always loved custard tarts more even than custard and I really love custard! I’m really intrigued by this version – could be the next sweet thing I attempt. Looks gorgeous. This reminds me of my grandmother’s Custard Pie. An American version, I suppose, of your milk tart. But her recipe was simply eggs, milk, sugar, a little salt, vanilla extract and nutmeg. It’s baked in a flaky pie crust. It has that wobbly texture you mention and it’s very light and just delicious. I’m going to try your recipe, too, if I can find custard powder somewhere here in Minnesota! That milk tart looks so creamy and good! Bit behind the times here but just seen the page and now I am drooling again. My wife uses a recipe from many years ago taken from a recipe book put together by the local Methodist Church to raise funds. It uses condensed milk instead of ordinary milk and what a difference it makes to the flavour. The crust (only a base and sides, nothing on top)is made of crushed marie biscuits and butter although, being in the UK now, we use tea biscuits instead. Since being here (14 odd years), she has won many converts to rhis recipe and friends of our kids always ask if there is going to be melktert if we are having a get together.